Corian, known to be the original solid-surface countertop material made by DuPont, is composed of 33% binding resins and 60% minerals. A registered brand which was created in 1967, this polished stone material, from a distance, may look like stone, however, to the touch, it has a hollow-like feel, similar to that of a laminate countertop. 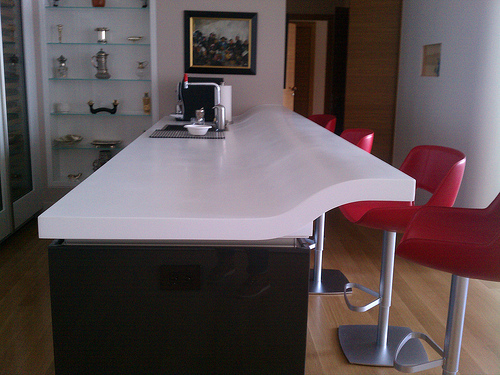 How much do Corian countertops cost? The costs of Corian countertops, like most countertop selections, will depend on a variety of factors, including the color, the thickness, the style and the texture you choose, to name a few. Not including labor costs, countertops can range anywhere from $40 to $70 per square foot while adding the labor costs can add another $500, bringing the grand total with materials and labor to about $40 to $70 per square foot, plus another $500 to $1,000+ for the install job. Do keep in mind that you may be able to find some remnants at local retailers for as little as $20 per square foot; however, you may be limited to how much is available at the time of purchase. The costs of Corian countertops can be hard as it is only sold via authorized retailers, and each retailer will be able to dictate its own price. The same can be said about contractors as your geographical region, the scope of the job and the contractor you hire can all affect the total costs as well. Since it can be hard to offer a definite answer, we highly recommend you check out the free quote comparison tool, HomeAdvisor.com. With this tool, all you need to do is explain your job, and with this information, licensed contractors will send you quotes for free. This is a great way to have the quotes come to you instead of researching qualified contractors for hours. Complex installation: If the installation tends to be more complex in comparison to other jobs, then the price can increase as most laborers will charge by the hour. For example, complex designs, patterns and making cuts for sinks and fixtures can all increase the time involved. Finished edges: Exposed finish edges can add to the overall cost, especially if it’s greater than 60 percent of the surface area. Removal: If you already have existing countertops that need to be removed, this is often not included in the estimates mentioned above and can add another few hundred dollars to the total cost. Regardless of the countertop choice you decide with, a contractor will always want to come to your home and sketch the area in question in order to place an order and have it pre-cut for the installation. During this time, he or she will sketch out all of all the appliance openings as well as the sink outline, including any inlay or edge treatments if necessary/requested. Inside a bathroom, any sink, vanity, wall surrounds, shower and/or bathtub outlines will be measured as well. Next, all of the appropriate measurements will be made, including the length and the width of the counter space and will be included on the rough sketch in order to send to the counter material retailer. With all of this information, your contractor will either choose a retailer of their choice or it may be up to you to find a retailer. Regardless, seeing the countertop is made from DuPont solely, you will need to find an authorized retailer that works with this specific product, and to find a retailer, you can do so via the official website at Corian.com. Once you find the retailer, your contractor will send in the measurements and you will simply wait for the new countertops to arrive. Corian, made by DuPont, is among one of the many countertop choices for homeowners and is considered to be a cross of laminate and granite and sometimes even referred to as the cousin to other solid surface-based counters. The solid surface is created by blending plastic and stone materials which are then poured into molds to create the graded sheets. A solid surface countertop, it has many advantages in comparison to other types, such as quartz and granite, including the many available colors and styles available, the non-porous attributes that can prevent stains, and the ability to complement other kitchen materials. While it can be more expensive than other choices, it is easy to clean, has sound absorption, a longer life cycle and a seamless appearance, all attributes that many other countertop materials simply do not have. What are they? Corian, as mentioned, is a man-made product, composed of 33 percent binding material and the rest being minerals, whereas granite is real stone, quarried directly from the earth, eventually sliced into slabs, honed and finally polished. Nothing is added to granite and is usually not associated with any brand names. The cost: The costs, for both Corian and granite, are quite comparable installed. Appearance: The appearance of each type really comes down to your personal appeal. Some people like the look of a natural stone like granite, while others like the look of Corian, even though some say it has a plasticky look to it but lacks the plastic shine of a laminate material. Resale value: For most, granite can return on investment when you plan to sell your home due to the nationwide appeal, while Corian, even though the brand is nationally recognized, often doesn’t offer the same results as again, it will greatly depend on the buyer’s opinion of the material. Maintenance: Granite will need to be sealed at least every two years to minimize the risk of staining, but Corian, on the other hand, will never need to be sealed. While both materials are considered to be nonporous and easy to keep clean, granite is more susceptible to etching from acidic materials. For heat-resistance, Granite is known to be the better option as you can set anything hot on it without having to worry, but for Corian, the material can be scorched if you’re not careful. DuPont includes a 10-year warranty for the material, but as for the installer, this will greatly vary depending on who you hire. Most reputable installers will back up their work for at least a year, but again, this will vary, so it’s best to talk with your installer ahead of time to know what their warranty, if they even offer one, includes. As for the DuPont warranty, it will not cover damage that has been caused by excessive heat, exposure to weather, misuse, mishandling, acts of nature and/or chemical abuse. Be sure to read the fine print to know exactly what’s covered. Never cut or place hot items on the counters; instead, make it a habit to use a cutting board and hot pads to avoid wearing down the finish. Even though the material is considered to be heat resistant, direct heat should still be avoided. Cleaning a Corian countertop is much easier than other materials as it only requires a pinch of soap and hot water. Be sure to avoid any abrasive cleaning pads or window cleaners as this can often leave a waxy buildup causing your counters to discolor, removing a sheen it may already have. The colors of Corian can all be viewed via the official website.